Abies nebrodensis, as described by Michele Lojacono (1853 – 1919), work later completed in 1908 by Giovanni Ettore Mattei (1865–1943), in Bulletin du Jardin Botanique Palermo, 7th edition, is commonly known as Sicilian fir, as well as abete dei nebrodi in the Italian language. 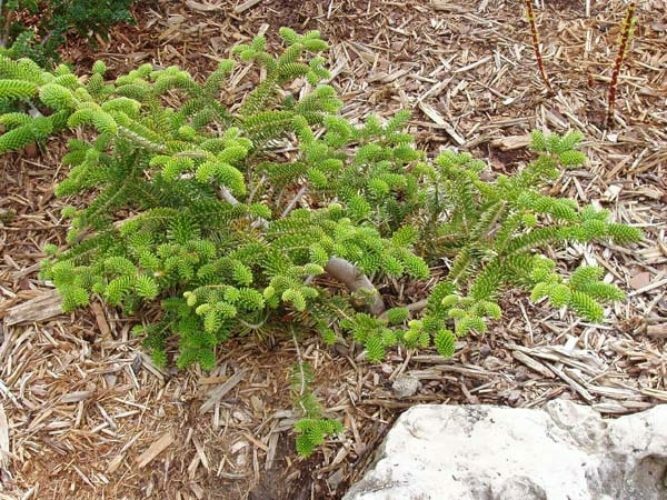 It is closely related to European silver fir (A. alba), which replaces it in the Apennine Mountains of Italy and elsewhere further north in Europe. 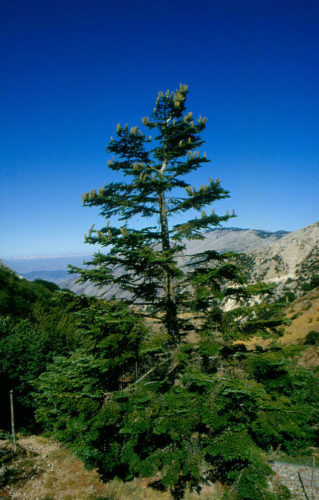 Some botanists treat Sicilian fir as a variety of silver fir, as Abies alba var. nebrodensis. The species name refers to Italy's Nebrodi mountains where it is native. Description. Sicilian fir is an evergreen coniferous species of tree which will grow to mature heights of 50 to 80 feet (15 – 25 m) with a trunk of up to 3.2 feet (1 m) in diameter at breast height. Bark is pale gray in color, becoming scaly with age and ultimately furrowed mostly at the base. Branchlets are hairless in the shallow grooves between the leaf bases. Foliar buds measure 0.16 to 0.2 inch (4 - 5 mm) long and not particularly resinous. The leaves are needle-like, flattened, measuring 0.6 to 1 inch (1.5 – 2.5 cm) long and 0.08 inch (2 mm) wide by 0.02 inch (0.5 mm) thick, glossy dark green above, and with two greenish-white bands of stomata below. The tip of the leaf is blunt with a notched tip, but sometimes with a pointed tip, particularly on shoots high on older trees. Pollen cones measure (15 - 20 mm) long and are purple in color. 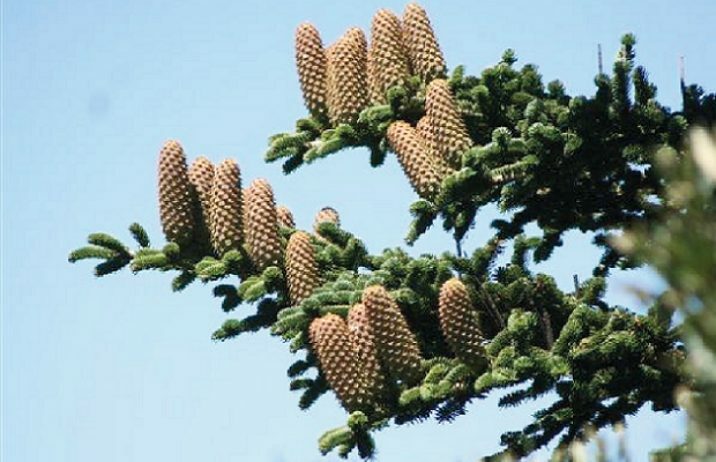 The seed cones are 4 to 6.4 inches (10 – 16 cm) long and 1.6 inches (4 cm) broad, with about 150 scales, each scale with an exserted bract and two winged seeds; they disintegrate when mature to release the seeds. Seed bodies are are 0.32 to 0.4 inch (8 - 10 mm) long with a slightly longer attached wing. Distribution. This species is native to Italy — the Nebrodi and Madonie mountains in northern Sicily and perhaps the toe of Italy where it is found growing at elevations of 4,600 to 5,200 feet (1,400 - 1,600 m) above sea level, either in pure stands or mixed with black pine (Pinus nigra) and other trees and shrubs, particular in the lower limits of its range. 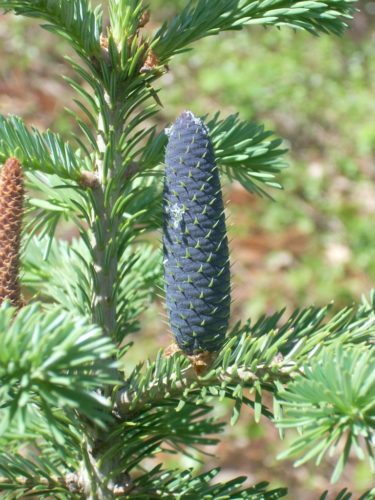 As a result of deforestation, this conifer is now extremely rare, with only 21 mature trees surviving. Replanting programs are meeting with limited success due to heavy grazing pressure by livestock belonging to local farmers. It is classified as critically endangered by the International Union for the Conservation of Nature (IUCN) Red List. Hardy to USDA Zone 7, cold hardiness limit between 0º to 10ºF (-17.7° and -12.2°C).